This Sound Healing Drum tuned like all drums in mix B-minor scale. Mystical and crystal clear. Both joyful and melancholic. Travel over the border of the Universe. Gives a feeling of weightlessness and happiness. 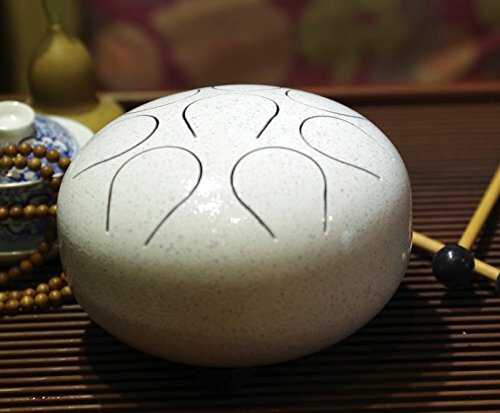 Perfect for Personal Meditation, Yoga, Zen, Sound Healing. Can be played by anyone of age. Recommended for beginner, intermediate, and advanced players. Mini Steel Tongue Drum great for rhythmic melodies. It is our smallest and most compact drum. These little ones have a big sound at a small price! It’s so easy to bring it along anywhere you go. Play it in the park, bring it over to a friends house, or take it camping. Fits in day packs for easy travel and even has its own optional padded bag for transport and storage. How To Play on this drum? User maintenance is simple, just wipe it sometimes inside and out with a natural oil to avoid corrosion. Protect from bumps and scratches. Have more question, please ask, we all time glad to help you.